This season, Padgett has emerged as Homewood’s go-to player. He leads the Patriots in scoring, with 17 points per game, and rebounding, with 9 rebounds per game. Journal photo by Mark Almond. Logan Padgett spends as much time with his dad as he can. 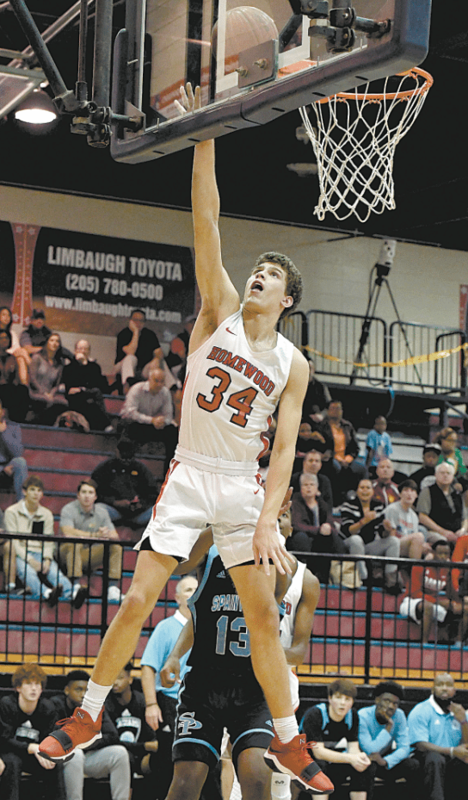 That’s because Homewood’s 6-foot-6-inch junior forward wants to follow in his dad, Scott Padgett’s, footsteps and become a college basketball player. Scott Padgett played college basketball at Kentucky from 1995 to ‘99, helping the Wildcats win the 1998 NCAA championship. He was a first-round draft pick, selected 28th overall by the Utah Jazz, in 1999 and spent eight years in the NBA. He’s in his fourth season as head coach at Samford. This season, Padgett has emerged as Homewood’s go-to player. He leads the Patriots in scoring, with 17 points per game, and rebounding, with 9 rebounds per game. Homewood finished the regular season with a 14-14 overall record and in a three-way tie for second place in Class 6A, Area 10. In the tie-breaking procedure, the Patriots received the No. 2 seed for the area tournament this week and are scheduled to play Shades Valley at 5:30 p.m. Wednesday at Parker, the tournament host and No. 1 seed. Coming into the season, Padgett knew he would have to lead the team because the Patriots’ top two players had moved on. Center Trey Jemison, a Clemson signee, transferred to Hoover for his senior season and forward Luke Touliatos graduated and now plays for Padgett’s dad at Samford. Shepler said Padgett has embraced the role, stepping up his game to give the Patriots what they need. “He’s come a long way this year,” Shepler said. “He was on our state championship team as a freshman and has been progressing since then, but this is the first year for him to really understand his game and his skills. “He’s got a much higher ceiling as player. A couple of skills we’re working on are his 3-point shooting ability and his ball-handling. He has the ability to be a better shooter from behind the arc if he puts in the time. He’s a good ball-handler, but he can get better. Padgett understands and is working to improve his game. At the start of practice and after practice, he and teammates try to attempt at least 50 3-pointers in a minute. On Saturdays when the Patriots don’t have a game and on Sundays, he goes over to Samford to practice 3-pointers. That’s why Padgett’s dad keeps urging him to get stronger and add some weight. “He’s been wanting me to get up to 200 pounds since my sophomore year, but I’m still only at 190,” Logan Padgett said with a laugh. Logan Padgett realizes that gaining some more muscle will enhance his ability to play at the next level. He said he has not gotten serious about recruiting yet, but he will start taking it more earnestly once he starts playing AAU ball this summer. He already has given up football. He played wide receiver for the Patriots during the 2016 season but elected not to play in 2017. “My true love has always been basketball, so now is the time for me to focus and lock in on it,” he said.